Plains, Georgia: In the wee hours of a crisp, wet fall morning, hundreds of cars drove slowly over a dirt path in this tiny rural town then parked among a grove of trees. The occupants exited to line up in leisurely fashion to hear a man who would soon become one of the newest Grammy Award nominees. Newest, perhaps, but hardly the youngest. In fact, this nine-time nominee and two-time winner ranks high on the list of contenders for the title of oldest Grammy nominee in history — all the more notable for someone who doesn’t so much as sing, hum, strum, pluck, pound or otherwise operate a musical instrument. books written by former US president. At 94, the nation’s 39th chief executive is impressively active. 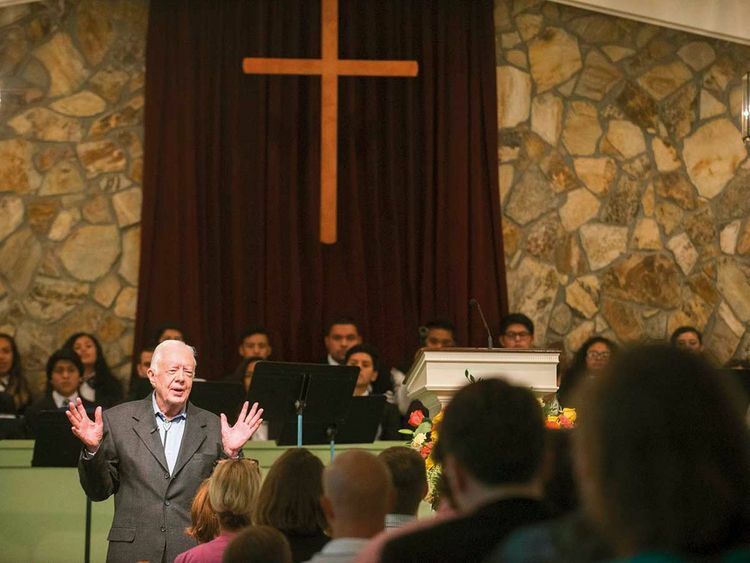 Among his many post-presidential duties, one of those closest to his heart is speaking every other Sunday at his hometown church in Plains, Georgia, population 727 as of 2017. Over Veterans Day weekend, his early November talk fell on the holiday, making the day that much more resonant given his service in the US Navy shortly after the Second World War. The website for the Maranatha Baptist Church in Plains advises visitors to arrive before 5.30am to get a seat in the church’s main sanctuary where Carter speaks. But by 5.30am on this weekend, nearly 100 cars had already arrived, and more were slowly finding their way through the predawn darkness. By conservative estimate, more than 400 people had made this trek, some covering thousands of miles, for the opportunity to visit with an ex-president. 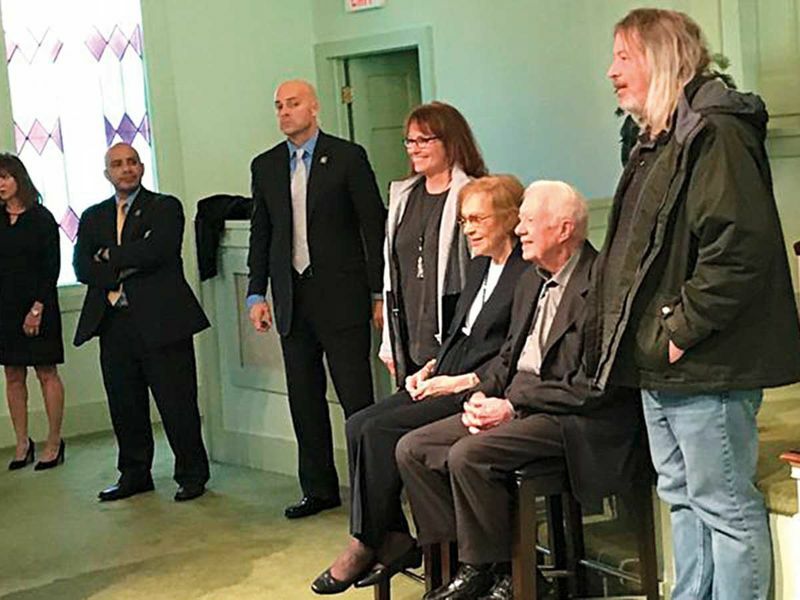 In the nearly 40 years since he lost his bid for a second term, Carter’s stature has grown for the in-the-trenches work he and former First Lady Rosalynn Carter — he proudly mentioned they’ve been married 72 years — have done with Habitat for Humanity and as an ongoing ambassador of US goodwill. We are kind of a conglomerate country of people who are innovative and willing to take a chance, entrepreneurs, and we try new things. The process for entering the building is rigorous, and all are wanted by Secret Service agents before setting foot inside. Those who arrived hours earlier — some began lining up around midnight — snagged the best seats in the church’s modest sanctuary, which faces an altar on which a simple wood cross hangs. It’s one of several pieces in the church made by the former president himself, along with gorgeous wood collection plates. They’re signed with his initials, “J.C.,” which elicited smiles or double takes from many visitors as a sample was passed around the room. Those who couldn’t find seats in the sanctuary were ushered into the church’s utilitarian overflow room, which was standing room only and equipped with a video screen that would relay his talk. The difference between the turnout for a Jimmy Carter Sunday and a non-Jimmy Carter Sunday is striking. The Veterans Day programme included a report on the previous week’s attendance: regular congregants: 27; Visitors: 14. Carter’s niece, retired grade-school teacher Kim Fuller, alerted visitors on the morning’s protocol: Do not applaud when he enters the room. (“He hates that,” she said.) Also, she said, visitors he might call on should address him as “President Carter” — not “Mr President” (a title reserved for the current occupant of the White House), and certainly not “Jimmy,” a privilege requiring a degree of familiarity most strangers haven’t earned. His talk was set to begin at 10am, but around 9.15, without so much as an introduction, a door at one end of the overflow room popped open and Carter stepped in quickly to greet the crowd before his scheduled talk in the sanctuary. “Good morning,” said Carter, dressed in a modest green suit and white shirt gathered at the neck with a bolo tie of Navajo design. “How did Kim do?” he asked. “Did she do OK? “When I need to find out what I did when I was president — and I say that without exaggeration, because it’s really honestly told, I go to Stu Eizenstat’s book,” Carter said. As is his custom when he speaks in church, Carter conducted a quick survey of the far-flung places visitors have come from. One of the signature missions of the Carter Centre in Atlanta — which the couple created in 1982, shortly after moving home to Plains in 1981 — was to observe elections in various countries to help ensure that they are carried out democratically. Since 1989, the Carter Centre has sent teams to points around the globe to monitor more than 100 national elections. Following the geographical survey of his visitors, he cut to the chase and asked those on hand to identify key issues they thought the world will be grappling with over the next decade. It’s something, he said, that helps in setting long-range goals at the Carter Centre, which targets a few issues at a time, ones on which the Carters think they can have a real impact. Among the issues enumerated by Carter during succinct, astute exchanges with the morning’s churchgoers: a global rise in nationalism and authoritarianism; a weakening of democracy; nuclear proliferation; climate change; election meddling; rising expressions of racial and religious bigotry; income inequality; disease in third-world countries; cyber warfare and mental health — the latter, a longtime special interest of Rosalynn Carter, who made that her primary focus during her years as first lady. In addition to election monitoring and proselytising for better treatment of people with mental health issues, the Carters have also worked to provide clean drinking water in communities in many Third World countries, and their long-standing work with Habitat for Humanity continues to this day. He credited Habitat founders Millard and Linda Fuller for changing his and Rosalynn’s lives and told the congregation that, the Fullers’ son, Chris Fuller, had been invited to deliver the morning’s formal sermon following Carter’s talk. After about 20 minutes of quizzing visitors and discussing national and international affairs, Carter turned to the topic of the morning: the Old Testament book of Ruth. During the entire talk, he made no direct reference to President Trump, whom he described as “a disaster” in an interview last year with the Washington Post. “I do,” he responded even-handedly. “I believe that. And why do you think that is? “The United States is made up of people — except for Native Americans — who came here,” he said. “Our ancestors, and every one of us who came here from a foreign country, kind of took a chance, right? Because we wanted a better life; we wanted freedom to worship the way we wanted to or something like that. “We are kind of a conglomerate country of people who are innovative and willing to take a chance, entrepreneurs, and we try new things, and we’re willing to make a change, right?” Carter asked. “Our ancestors proved that, and some of us have inherited those genes. Scattered applause greeted the end of his talk, and he shook his head, saying, “No, don’t do that.” Instead, he invited visitors to stay for Chris Fuller’s address, holding out the carrot that helped draw many to this remote site: “After church is over — we’ll have a good sermon, I’m sure — Rose and I will be having photographs with everybody. True to their word, they sat in tall chairs, side by side — Rosalynn, 91, at her husband’s right — at the front of the sanctuary for more than 45 minutes as individuals, couples and entire families shuffled through a line to flank them for happy snaps taken on their own cameras and cell phones by Kim Fuller or other church personnel. After the day’s final photo, they held hands and ambled together out a side door, stepping up into one of the two Secret Service SUVs waiting to take them back to their compound less than three kilometres away. Along the route home is a five-hectare land parcel the Carters donated in recent years for a solar farm that provides electricity to 200 houses in Plains. It’s another programme Carter championed during his presidency, when he had solar panels installed at the White House as a visible reminder of one potential solution to the fossil fuel crisis that gripped the nation. Those panels were removed by Reagan. James Earl Carter Jr. was elected president in 1976 by fewer than 1.7 million in the popular vote, winning the electoral college handily with 297 votes to President Gerald R. Ford’s 240, leaving Ford the only person ever to serve as president without having been elected to that office or the vice-presidency. Carter’s campaign was built on bringing integrity back to the White House, two years after Richard Nixon avoided impeachment by resigning in the wake of the Watergate scandal. But Carter’s popularity soon took a beating when the Middle East oil shortage of the late ‘70s caused gasoline prices to skyrocket. Even more damaging to his legacy was the international crisis over US hostages taken during the 1979 Iranian Revolution that ousted US-backed Shah Mohammad Reza Pahlavi. A failed rescue operation in 1980, during which eight Americans and one Iranian civilian were killed, only exacerbated criticism of Carter, who also was hammered as inflation shot from 4.6 per cent in 1976 to 12.5 per cent during his final year in office, after cresting at 13.3 per cent a year earlier, according to government figures. After a landslide victory for Ronald Reagan in the 1980 presidential election, the remaining hostages were freed on inauguration day, January 20, 1981. Despite its challenges, the Carter administration passed more legislation than any other dating to Lyndon B. Johnson. An exhibit on his presidency at the Jimmy Carter High School Museum in Plains, housed in buildings where he attended high school, notes that he appointed more women to political positions than all previous presidents combined.